Women’s March 21 January 2017, London. 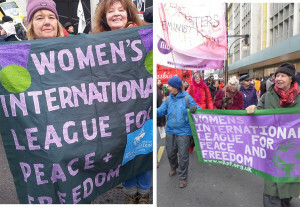 WILPF UK Bristol presents #BristolFemaleLeaders – 19 November in Bristol. The International Day for Elimination of Violence Against Women – 11am – 1pm, 25 November in Brighton. Reclaim the Night – 25 November in Cornwall. Remembrance Day White Peace Poppy Wreath-Laying. 13 November 2016 in Brighton. WILPF and Voices of African Women on Women, Peace and Security in the D.R Congo. 1 November in London.